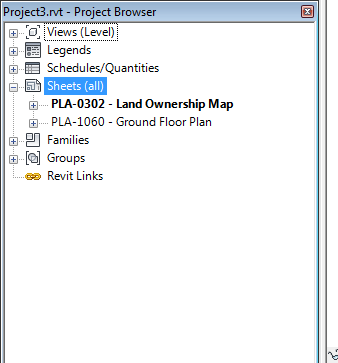 In my first Revit post to this Blog, I will look at the concepts of Sheets in Revit and how to create and organize them. 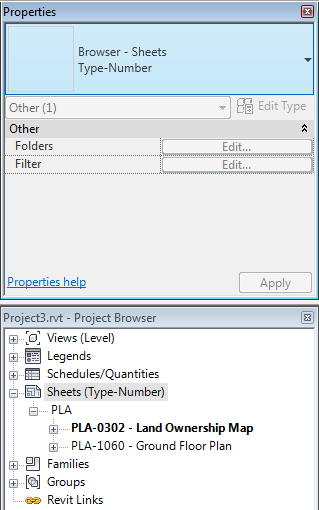 Unlike AutoCAD where sheets are tabs in one or more AutoCAD drawings, Revit manages all the sheets for a project in one place. With tools to group, sort and filter sheets, projects large and small can be managed with high visibility and relative ease. Revit maintains links and references between sheets and other objects such as views, revision schedules, elevation and section references. 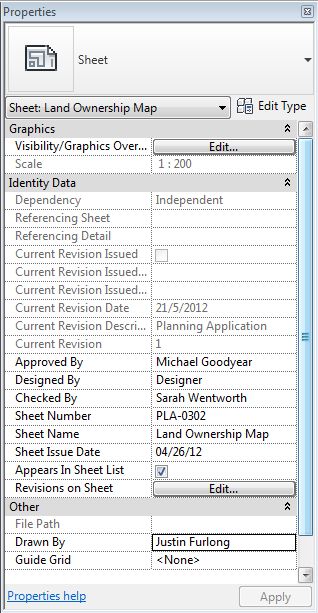 If a Sheet is renumbered in a Revit model, all references to that sheet are updated automatically. This is a very powerful feature which can significantly reduce the time required to coordinate sheets on a project. Remember though, with power comes responsibility. If you have issued a sheet with a number, then you may confuse the recipients by changing the sheet number. Sheets are accessed through the Project Browser. By default all sheets are shown and there is no grouping or filtering. Sheets are sorted by Sheet Number. To add a new Sheet, right click on Sheets (all) and select New Sheet. A dialog will prompt for a title block. You can select your own or one of the generic title blocks that come with Revit. My next post will show you how to create a title block. The properties for a sheet can be accessed in the properties palette once a sheet is selected. The following table lists the properties for sheets. Current Revision Read Only Yes Yes Derived from Sheet Issues/Revisions. This field will show the most recent revision. Scale Read Only Yes Yes Derived from scale of views in the sheet. If all the view scales are the same, it will show that scale, otherwise 'As Indicated' wil be shown. Print Set NA Yes Print Set is not a property but Sheets can be filtered by Print Sets. This is a powerful way of arranging sets of sheets. Refer to my next blog for more on this. The above are all parameters built into Revit. You can add additional custom parameters through Project Parameters which can also be grouped and filtered. Project Parameters is another day's post though. Note: Drawn By, Designed By, Checked By and Approved By are per sheet and not per Revision. None or all of these properties can be used and included on the title block. In Revit, Revisions have their own strict properties which will be covered in the next post on Sheets. To Group, Sort and Filter sheets, right click on Sheets (all) and select Type Properties. The all type is a system type and cannot be edited or duplicated. For this example, select the Sheet Prefix type and click the Duplicate button. You will be prompted to give it a unique name. For this example, name it Type-Number. 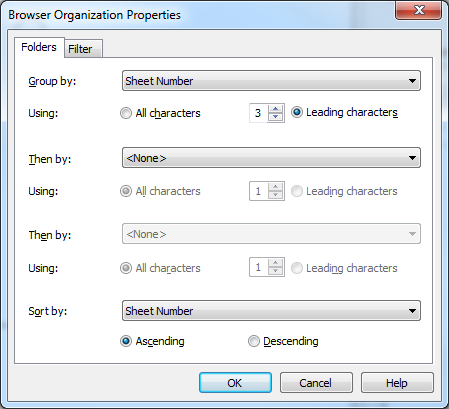 There are 2 Type parameters for Sheets, Folders and Filter. These can be changed for the current Type by clicking the Edit button. Folders deals with Grouping and Sorting Sheets. 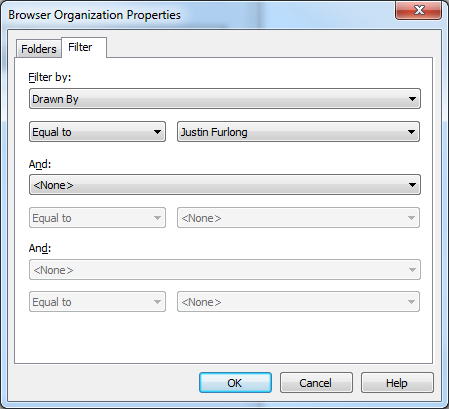 There are no folders in reality, just the concept of sorting sheets into a hierarchical list like a windows explorer view based on sheet property values. Sheets can be Grouped By up to 3 Sheet Properties and Sorted by a single property. The Groups will be sorted automatically in alpha-numeric format. For this example, our sheets numbers are prefixed with 3 letters to designate a type of document. PLA refers to planning drawings and SKE refers to sketch drawings. Select Sheet Number as the first Group By parameter and then select 3 Leading characters. Set Sheet Number as the Sort By parameter. 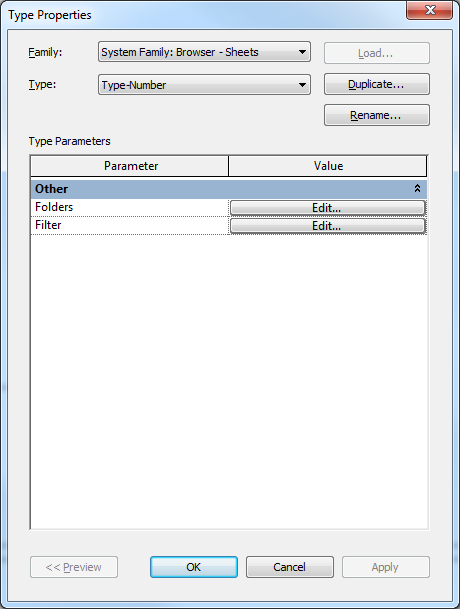 The second Type Parameter is Filter which allows sheets to be filtered based on selected parameter values. For example if a filter is added whereby Drawn By is equal to Michael Wordsworth, then only sheets drawn by Michael Wordsworth will be shown. For the following example, I have ignored the filter and the sheets are grouped on 1 level by the first 3 letters of the Sheet Number. You can quickly change the sheet organisation by selecting Sheets in the project Browser and then selecting the pull-down list in the properties palette. I hope you found this useful. I have steered away from anything too complicated for now to keep this post simple and to the point. The next post will hone in on how to create a title block which will utilize the sheet properties above. but I did not understand duplicating the sheet. could you explain this please. your sentence "select the Sheet Prefix type and click the Duplicate button". when I click on type properties, it is not possible to duplicate. if I select a title block (sheet) then go for type properties, I can duplicate . but I cant get the window as you shown in the example pic. for example, it is just duplicating an A1 sheet.